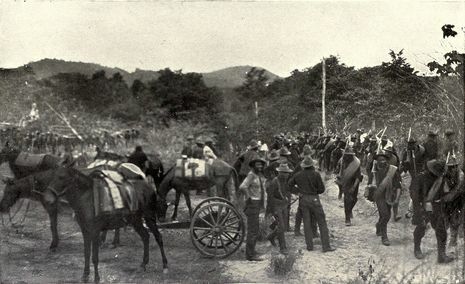 The Battle of Las Guasimas of June 24, 1898, part of the Spanish-American War, unfolded from Major General "Fighting Joe" Wheeler's attempt to storm a Spanish position in the jungles surrounding Santiago. Commanding a division that included the 1st U.S. Volunteer Cavalry and the 10th Regular Cavalry, Wheeler engaged a rearguard under Major General Antero Rubín. The Spanish infantry held its ground, skewering the advancing American regiments with rifle volleys; however, after an exchange of fire lasting two hours, Rubín, rather than press his advantage, pulled his men from the trenches and resumed his ongoing retreat in the direction of Santiago. 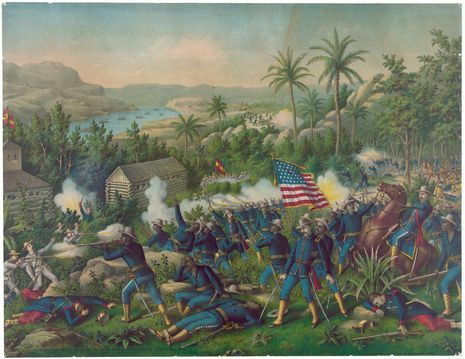 The yellow press seized upon this to describe the battle as a rout; in reality, Wheeler had been much closer to defeat. 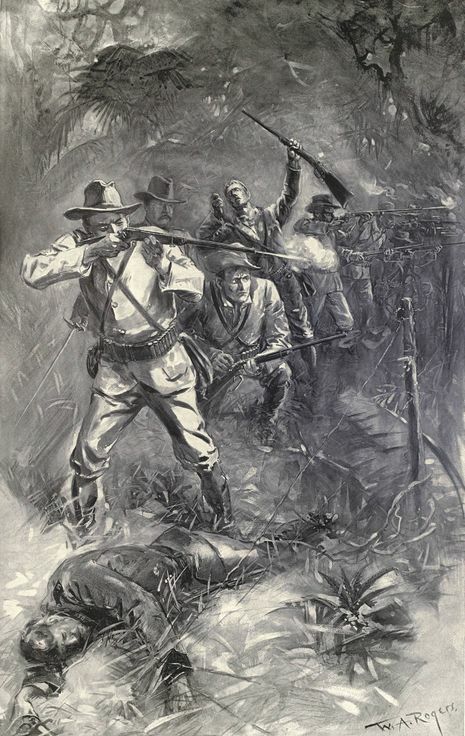 Throughout the afternoon of June 23rd General Lawton's First Brigade (which included the Rough Riders) under General Young, continued its advance to Siboney. It was long after nightfall when the soldiers reached their destination and began setting up camp for the night. Almost as quickly as the Rough Riders built fires to prepare their dinner, a tropical rain storm hit, drenching them all and extinguishing their fires. The weary soldiers, men accustomed to traveling everywhere on horseback, were tired after the day's march. The heavy rain and lack of shelter did nothing to ease their comfort. Meanwhile, Colonel Leonard Wood departed to meet with General Young. Lieutenant Colonel Roosevelt likewise met with Captain Capron of the Rough Riders as they discussed the coming battle. After a couple hours the rain ended and the men began to bed down. Close to midnight Wood returned and awakened Roosevelt to detail General Young's plan for meeting the enemy the following morning.